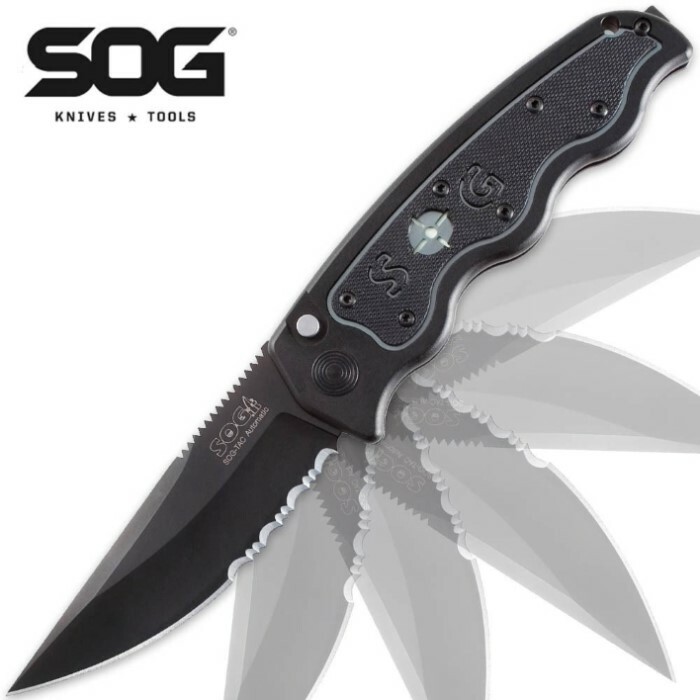 SOG Tac Auto Black TiNi Half Serrated Blade 8 IN | BUDK.com - Knives & Swords At The Lowest Prices! The SOG-TAC is an invigorating new design that looks like nothing else. It is big but relatively slim and is specifically designed for action. Blade travel is definitely fast and once open it locks up like a floor safe. The machined 6061T6 hard-anodized aluminum is inset with G10 type textured inlays. There is also: a safety button that double locks the blade in the open/closed position, reversible bayonet style clip and a gorgeous upswept half-serrated blade. The 3 ½” AUS-8 blade is razor sharp. 8” ov; 4 ½” cl.